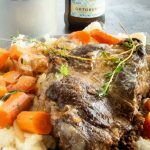 This Sauerbraten recipe (traditional German pot roast) is made in the slow cooker it's tender it just falls apart. Marinated in vinegar, wine and simple spices it's perfect for your own authentic Oktoberfest party! Combine 2 cups brith, wine, vinegar, one of the onions, the crushed garlic, sprigs of thyme, juniper berries, peppercorns and cloves in a pan. Bring to a boil then simmer for 5 minutes. Allow to cool completely. Once marinade has cooled, place the roast in a large ziplock bag and pour the marinade over the top. Seal the bag after removing any air pockets. Place bag in fridge to marinate for 48 hours. Turning a couple of times to make sure meat is well covered in all edges. Once marinade is done remove the meat from the zip lock bag. Strain solids reserving 2 cups of the vinegar/wine liquid. Use a paper towel to dry roast, and season generously with salt and pepper. Place the roast in the bottom of the slow cooker(or on a side plate if you are using the slow cooker container) Caramelize the remaining onions, and the carrots for 5-7 minutes until the onions are softened and starting to brown and the carrots are starting to brown too. Then add the flour, garlic and thyme leaves and stir for 3 mins more. Remove the vegetables and deglaze the pan with the strained marinade and the remaining cup of broth scraping up the brown bits on the bottom of the pan. Add the crushed gingersnaps, season with salt and pepper to taste. Spoon a couple of spoonfuls of the sauce over the roast and veggies then place the gravy in a gravy boat for people to sauce their own. If you dont have juniper berries, you can use gin. Sub 1/4 cup Gin.